Angels Camp, CA...Mornings can be tough. We're here to help. 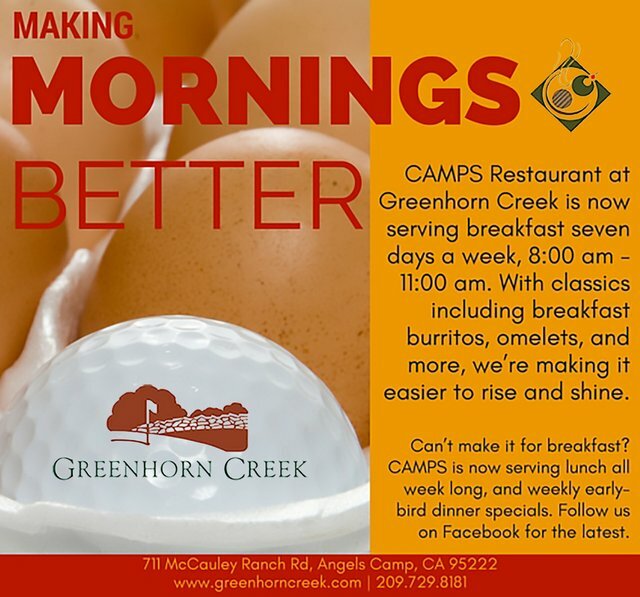 CAMPS Restaurant is now serving breakfast seven days a week, from 8:00 am to 11:00 am. A limited lunch menu is now being offered on Mondays and Tuesdays as well. Check out the Golfer's Menu for more details, and stop by to make us your new favorite breakfast spot in Angels Camp! CAMPS Restaurant at Greenhorn Creek is your destination for award-winning fine dining in the Mother Lode. Featuring an eclectic, elegant menu of seasonally changing cuisine inspired by the tastes of Northern California, CAMPS proudly serves ranch-raised, corn-fed USDA Calaveras County beef, locally grown produce, and a carefully curated selection of local wines provided by our nationally recognized Vintner Memebers.